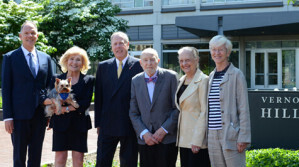 [June 8, 2016; Philadelphia, PA] – With a generous $1 million gift from Vernon and Shirley Hill, Penn Vet will establish the Robert Marshak-Vernon Hill Scholarship Fund. In collaboration with the Wharton School of the University of Pennsylvania, the fund will support the training of leaders and entrepreneurs with the vision to advance both the science and business of food animal production in order to help ensure global food security. The scholarships will support qualified individuals in the Penn Vet community who will pursue the combined VMD-MBA degree at Penn Vet’s Center for Animal Health and Productivity and the Wharton School. Marshak-Hill scholars will be required to develop projects that explore the applications of economic and business principles to the health and productivity of livestock industries. Vernon Hill, a 1967 undergraduate alumnus of the Wharton School, and his wife Shirley are long-time supporters of Penn Vet. They have named the scholarship in honor of Dr. Robert Marshak, Penn Vet Dean from 1973 to 1987. Marshak’s passion for research and teaching in animal health and production has been instrumental in providing opportunities for Penn Vet students to impact world health and global food security. “Dr. Marshak transformed veterinary medicine, and we are pleased to partner with him as Penn Vet and the Wharton School take the next big step,” said Hill. The Hills’ generosity to Penn Vet also includes a gift of $10 million in support of the Vernon and Shirley Hill Pavilion, a teaching and research center that opened in 2006, and the establishment of the Penn Vet World Awards in 2007, an innovative program that encouraged and rewarded visionary thinking and life-changing accomplishments in veterinary medicine. The integrated training will emphasize innovative solutions to the complex business, health, environmental, and societal challenges associated with intensive and small-scale livestock and poultry production in a global environment with a rapidly increasing demand for animal-sourced protein. Qualified individuals will benefit from the joint curriculum at two of the nation’s top educational institutions, where they will receive experience in veterinary medicine and business platforms on leadership, economics, finance, competitive strategy, and marketing. Those completing the multi-year program will obtain their veterinary and MBA degrees and a certificate in Food Animal Production Medicine. Marshak-Hill graduates will have unique qualifications for leadership roles in food animal agribusiness, government, non-governmental organizations, public health, research, and academia. The combined VMD-MBA degree program at Penn Vet and the Wharton School was established in 1981. David Galligan, VMD, MBA, Professor of Animal Health Economics and Director of the Center for Animal Health and Productivity at Penn Vet’s New Bolton Center, will oversee the updated program and will mentor the Marshak-Hill scholars. Penn Vet’s Center for Animal Health and Productivity serves the agricultural community by developing innovative animal management tools and strategies for promoting economic efficiency and environmental sustainability. The University of Pennsylvania School of Veterinary Medicine (Penn Vet) is a global leader in veterinary education, research, and clinical care. Founded in 1884, Penn Vet is the first veterinary school developed in association with a medical school. The school is a proud member of the One Health initiative, linking human, animal, and environmental health. Penn Vet serves a diverse population of animals at its two campuses, which include extensive diagnostic and research laboratories. Ryan Hospital in Philadelphia provides care for dogs, cats, and other domestic/companion animals, handling more than 30,000 patient visits a year. New Bolton Center, Penn Vet’s large-animal hospital on nearly 700 acres in rural Kennett Square, PA, cares for horses and livestock/farm animals. The hospital handles more than 4,000 patient visits a year, while the Field Service treats nearly 37,000 patients at local farms. In addition, New Bolton Center’s campus includes a swine center, working dairy, and poultry unit that provide valuable research for the agriculture industry.